I'm like most Mother's, I love little kids shoes. 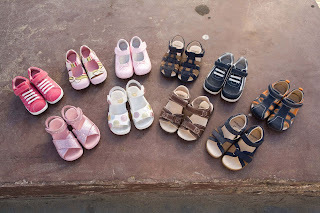 I love baby shoes, boys shoes, girls shoes, sandals, etc. Things always seem to be much cuter in small versions. I received a darling pair of Pediped shoes named, Abigail. They're a pale shade of pink with a medium pink blossom sewn right onto the top. The fact that they are a Mary Jane makes them even better in my eyes. I adore Mary Janes! The Abigail is part of Pediped's collection of FLEX footwear. They are created for toddler feet and ultra flexible. The FLEX shoes allow a young child to move, jump, and run like they are running on bare feet. As a mom, I really like the inserts for the shoes, they are very soft and supportive, I seriously need to find an adult version of these now. They even give you an insert you can put in the shoes if a child is a half size too small, for instance. I like that the soles of the shoes coordinate with the shoe color. I generally don't care for a light pink shoe with a bold, black sole on it. The Pediped Originals are also great shoes. They are made with infants to young toddlers in mind. The Originals are made with a soft leather sole to move and bend with a new crawler and walker in mind. They are soft and move with the foot which allows for proper development while providing support. The selection has been fabulous too. I had a chance to browse through the shoes today to see the choices and they really do have an amazing selection of Spring and Summer shoes. They have a wide variety of colors for girls especially,(you know they get all the good stuff!) and I was even surprised to see how many boy options were available. Pinks, blues, greens, metallic, blossoms, dots, eek! even cupcakes(limited edition). The boys have camo, dress shoes, tennis shoes, sandals and, boots. I'm sure you'll find something you'll love on there. I give these shoes a thumbs up! They are fashionable, flexible, safe for developing feet and ADORABLE.